Making it as a professional footballer in any capacity is certainly no easy feat. To get to the very pinnacle of the game is harder still, especially if players have to deal with setbacks or difficult circumstances on their way to the top. Hard work, dedication and ambition helped Alexis Sanchez escape the dusty and polluted desert town of Tocopilla in the far north of Chile. He would play barefoot in the street, but always believed he would make it to the top of the sport. Sanchez hardly knew his father, while his mother worked two jobs as a cleaner and a fish seller. As a child, the player himself would wash cars outside the local cemetery to earn cash. Even after making his professional debut at 16, and securing moves to Udinese, Barcelona, Arsenal and Manchester United, he has never forgotten his humble roots and has long supplied Tocopilla's children with boots and balls, as well as paying for real pitches to be built. Sadio Mane lived in cramped conditions in his early life in Senegal, sharing a house with nine other people, none of whom believed the young dreamer would ever make it as a footballer. So determined he was to play, Mane asked a family friend to get him some money so he could run away to the capital city of Dakar to realise his ambition. For 10 days, no one in his family knew where he was until the friend relented and told them. Mane was brought home and it was only after he had finished his education that his family accepted being a footballer was his destiny. Now, he's among the very best African players. Obsessive Compulsive Disorder (OCD) is often mocked and sufferers are derided as being 'weird', but at its worst it can be a severely debilitating and restrictive mental illness. Former England captain David Beckham revealed he had been dealing with OCD for a number of years shortly before the 2006 World Cup. He had successfully hidden it from his Real Madrid teammates, but colleagues at Manchester United would deliberately play pranks on him. Beckham has always managed to rise above his condition and stay in control. Adopted by his aunt and uncle, Carlos Tevez endured a difficult existence growing up in the Buenos Aires barrio of Fuerte Apache, a neighbourhood dominated by violence and crime. He was even hospitalised for two months as a child after being badly scalded by boiling water. It was that incident which gave him the distinctive scars on his neck and chest. Since making it as a professional footballer, Tevez has played in five different countries on three continents, winning eight national titles, the Champions League and Copa Libertadores. Now a Premier League champion and Europa League winner with Chelsea, as well as an Africa Cup of Nations winner with Nigeria, Victor Moses' life was turned upside down at the age of 11 after his parents were murdered and he arrived in England as an orphaned asylum seeker. Rising above his tragic circumstances, he began excelling at football after attending school in south east London and was soon picked up by Crystal Palace, even earning national attention at the age of 14 after scoring 50 goals in a single season. Moses made the step up to Wigan in 2010, before joining Chelsea in 2012 and finally establishing himself at Stamford Bridge when Antonio Conte arrived as manager. A young Ronaldinho initially grew up in poor surroundings in a favela of Porto Alegre in the south of Brazil, only moving to a more affluent area when his brother signed for local giant Gremio. 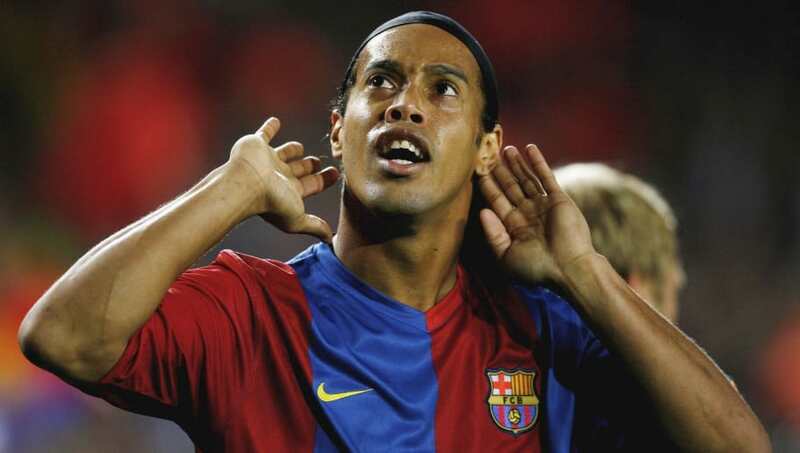 But tragedy struck the family when Ronaldinho's father died after suffering a fatal heart attack in a swimming pool - the 2002 World Cup winner was just eight years of age at the time. But he soon progressed through the ranks at Gremio, before moving to PSG and later Barcelona. It was at Camp Nou that this Samba star would cement his place as a global icon. Kaka won the World Cup, the Champions League and the Ballon d'Or during a glittering career, but none of it would have happened had he not made a miraculous recovery from a serious swimming pool accident suffered at the age of 18 in September 2000. The Brazilian, then an emerging talent at boyhood club Sao Paulo, was left fearing he would never walk again as a result of a spinal fracture. He credits God for healing him and allowing him to resume his blossoming career, and less than two years later he had his hands on the World Cup trophy with the national team. Kaka remains the last player other than Lionel Messi or Cristiano Ronaldo to win the Ballon d'Or. Cristiano Ronaldo came from humble beginnings on the Portuguese island of Madeira and had to leave home for the bright lights of Lisbon at the age of just 12 in order to pursue his dream of making it as a footballer. Things weren't easy for the future superstar, though, and he was expelled from school after throwing a chair at a teacher he accused of disrespecting him. Ronaldo was also later diagnosed with a 'racing heart' and underwent surgery to save his career before it had begun. But by the age of 18, he had signed for Manchester United and is now a Real Madrid legend. Always a small child, Lionel Messi was diagnosed with a growth hormone deficiency at the age of 10 that required expensive treatment only partially covered by his family's health insurance. His club at the time, Newell's Old Boys, promised to pay, only to renege on that pledge. Buenos Aires giant River Plate wanted him, but they couldn't afford to pay for his treatment either, leaving a trial at Barcelona his best option. Hard to believe given his achievements at Camp Nou, but the board were initially reluctant given that he was only 13 years old at the time. They eventually relented and Messi's first contract was signed on a napkin, with his whole family relocated to Spain to facilitate his dream. The rest, as they say, is history. This article is brought to you by Tomb Raider. In cinemas soon.